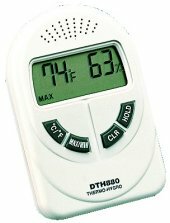 The Comark DTH 880, Combined Humidity Meter and Thermometer measures both humidity and temperature, displaying it all in the same screen. Designed to measure the temperature and humidity of rooms, this hygrometer and thermometer has a temperature range of 0ËšC to 40ËšC, whilst the humidity measurement range is 25% to 95% RH. Compact with clear display and useful bracket/holder. Seems very accurate in temperature and humidity readings.